Published: Nov. 1, 2018 at 09:14 p.m.
San Francisco 49ers quarterback Nick Mullens throws dart to wide receiver Kendrick Bourne across the middle for a touchdown. Published: Sept. 30, 2018 at 05:04 p.m.
San Francisco 49ers quarterback C.J. Beathard finds wide receiver Kendrick Bourne for a 2-yard touchdown pass. 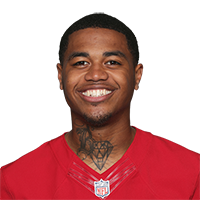 Published: Sept. 16, 2018 at 04:59 p.m.
San Francisco 49ers wide receiver Kendrick Bourne catches for a 4-yard touchdown.